Sage Greenscaping » Celebrate Cinco de Mayo with Free Pups! Celebrate Cinco de Mayo with Free Pups! We’re not talking Chihuahuas; we’re talking Agave Tequiliana (aka Blue Agave) pups. This handsome Mexican native anchors my Los Angeles garden and produces prodigious numbers of offspring with no help from birds or bees or me. The pups are the genetically identical baby plants that spring up from the base of the parent. While the plant can reproduce sexually, it probably won’t in my yard because the flower must be pollinated by a bat native to the Jalisco region of Mexico. I don’t think the bat migrated here with the plant. Plus, I don’t really want my beautiful specimen to flower because then it will die and I’ll have to wait for my pups to grow up. 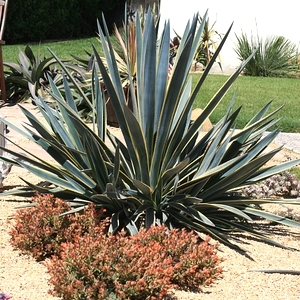 Blue Agave is what agave nectar is made from. Agave nectar is reported to be sweeter and thinner than honey and is a favorite sweetener of hard-line vegans. 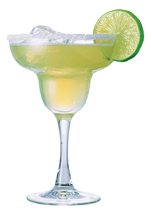 More famously, the best Tequila is made from 100% blue agave. George Clooney, my not-to-distant-neighbor in Studio City, has a company that produces Casamigos at $45 a bottle. But, to my mind, this plant is just too handsome to harvest. Then again, if George decides he wants to start an agave farm state-side, I have the pups for him. Seriously though, if you live in the LA area and you want a pup for your own garden, let me know.